Which watercolor paper is the best? How does Aquabord work? Can I make my own Watercolor Canvas? On this page are some information about the different surfaces which I use for my Watercolor Paintings. I am using Arches, Fabriano or Lanaquarelle. You need to stretch your watercolor paper in the weight of 140 Lb. I am using a simple wood board, wet my paper and then I staple it. I tried several times to use Water Activated Tape and sometimes it works and often it doesn’t work. To staple them is much easier and this works always. I don’t like to waste my time trying again and again.. You still can use some Water Activated Tape to get clean edges around your painting and then staple the paper on this tape to make sure that it really works. The Rose Painting left is painted on 140 Lb hot pressed watercolor paper from Arches. The Watercolor Paper from Arches and Lanaquarelle is available in blocks, sheets or in a big roll for larger sizes. A full sheet watercolor paper measures a bit more then 20″ x 28″. Blocks are available in different sizes from small to large. I often buy a big roll of watercolor paper in 140 Lb weight. This allows you to create very large watercolor paintings. It is possible to get great details on every paper. You simply need practice because each surface is different. The hot pressed paper in 140 Lb weight has a very smooth surface. It is like an eggshell or like painting on porcellain. But it is very unforgiving. A painting on this surface looks very fine. Cold pressed paper in 140 Lb weight has more texture. It is easier to handle and here you can always paint with beautiful fine details. It is more raugh than the hot pressed paper. Cold pressed paper in 300 Lb weight doesn’t need to be stretched. It is very heavy and although it is cold pressed it is not the same as it is in 140 Lb weight. The surface is more raugh than the 140 Lb weight and when I work on this surface I then work often on the dry paper. This allows to get beautiful texture and it is easier to safe white areas then. Fabriano offers this heavy paper also with a smooth texture. It is a mix of hot pressed and cold pressed. So you can work with great detail but the benefit of this heavy paper is again that you don’t need to stretch it. You need to frame these paintings and to put them behind glass for protection. The surface of Crescent Watercolor Board is similar to the hot pressed paper in 140 Lb. But it is very very unforgiving. This board doesn’t need to be stretched. It comes in large sheets and it is hard to cut it as the board is very thick. It is perfect for painting miniatures. 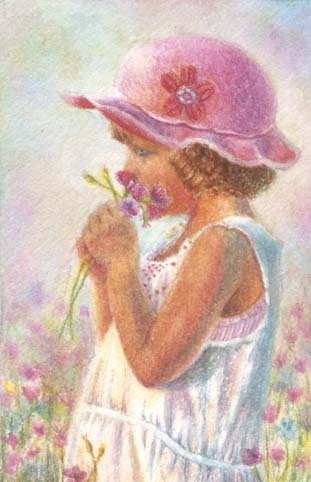 The painting left is a miniature painting and was painted on this Crescent Watercolor Board. This Board allows to work with details in this tiny size and so it is being used by many miniature painters. I also use Aquabord from Ampersandart.com. Aquabord is a hardboard panel. You also don’t need to stretch it. The surface is very raugh and you need some practice to figure out how to paint with layers. It isn’t very easy to handle when your only experience was maybe with 140 Lb hot pressed or 140 Lb cold pressed paper, but the more you paint the more you will become familar with it. The colours are rich and the surface of the Aquabord allows you to completely lift your colours back to white. It is wonderful for getting highlights back and if you don’t like your painting you simply can wash it out with a sponge and start over. The Aquabord is available in different sizes. A great benefit is that you don’t need to put this Aquabord behind glass. 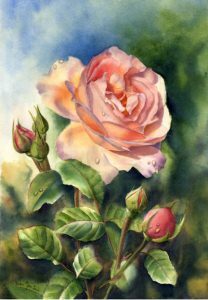 You need a fixative spray to varnish your watercolor painting. 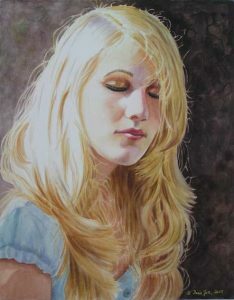 The Portrait of the blonde girl was created on Aquabord from Ampersandart. I am creating my Watercolor Canvas by myself. Watercolor Canvas is also not available here in Germany so I was happy to learn that I can create them by myself. I simply need some stretcher bars and put them together. Then I use my watercolor paper (the best is the 140 Lb heavy paper), wet it and stretch it over the stretcher bars and staple it on the back. This sounds very easy, doesn’t it. Below you will find a link with a demonstration video about how to stretch watercolor paper over stretcher bars and to make your own canvas. 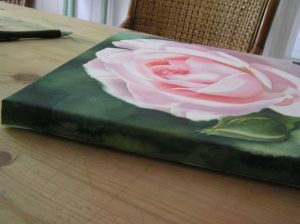 All these three Roses are painted on stretched canvas, using 140 Lb cold pressed Arches watercolor paper. The edges are painted so my collectors can enjoy hanging them without frame and without glass on their wall. 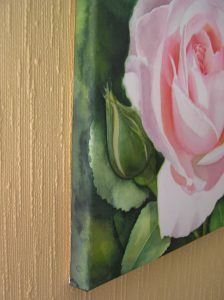 This Watercolor Canvas look the same as any stretched canvas for oil or acrylic paintings. It also can be framed like an oil painting and you don’t need glass. I made a short video demonstration on how I make my own watercolor canvas. The watercolor canvas will be varnished with a special fixative spray. I am using Golden Archival Varnish. But make sure that your painting is completely finished. 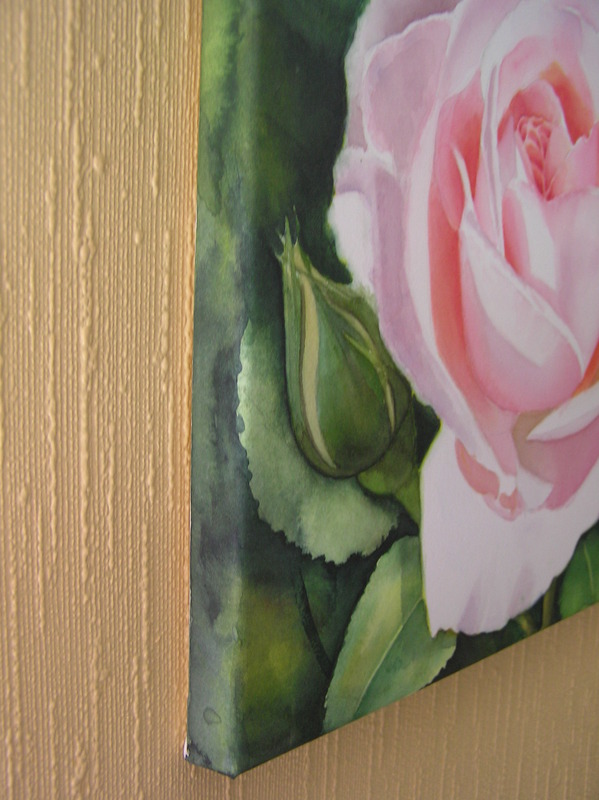 Once you have varnished your painting with this spray you cannot work on this watercolor painting again. I also painted on Reeves watercolor baord. Reeves Watercolor Board is also nice, but the board is very thin and it can happen that it starts to buckle. Then you need to wet the back of the board again to get back a flat board. I would not really recommend it. Which watercolor paper or board is the best? Try out which paper or board fits best to you and your painting style. Don’t stuck to only one paper because it was recommended by one person. See what is available and especially figure out what possibilities the different papers offer.